Keywords Genetic code, error robustness, origin of life. Buhrman, H, van der Gulik, P.T.S, Kelk, S.M, Koolen-Wijkstra, W.M, & Stougie, L. (2011). 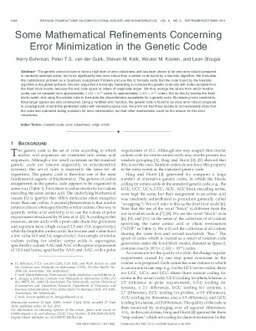 Some mathematical refinements concerning error minimization in the genetic code. IEEE/ACM Transactions on Computational Biology and Bioinformatics, 11, 1358–1372.